This is the default order in which the products will be sorted on Shop page. Visitors can change the sorting order if they want. You can show title of your download below thumbnail if this options is enabled.If this options is disabled then title will not be shown. You can select the size of thumbnail on shop page. Two thumbnail size is available Medium and Small. Medium thumbnail size is 300*250 and small thumbnail size is 180*150. 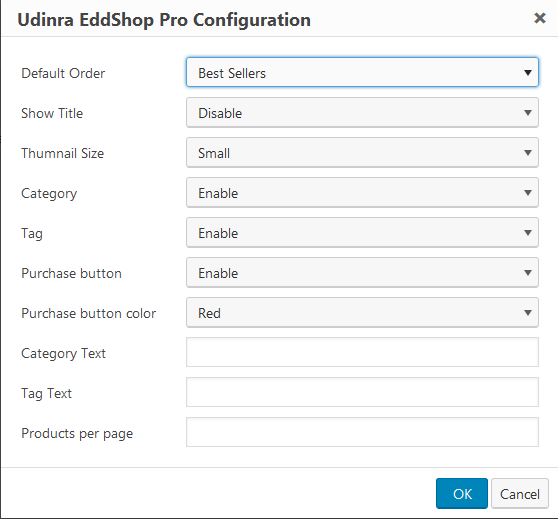 If enabled it gives a drop down to Buyer using which they can filter your product. For example if you have two download category (cat1 and cat2) then drop down will help three options (all , cat1 and cat2). The functionality is same as category but this one is for Tags. If enabled shows purchase button after every download. Buyer can use the buttons to purchase the items they want. You can select the color of purchase button from the drop down. By default Category drop down shows Category as the text. You can change it here. Something which is more meaningful to your Shop like Genre if you have Music to offer as downloads. Functionality is same as that of Category text but applies for Tag. By default the plugin shows 6 products per page. This is to ensure visitors get optimal experience.Loading too many products will impact performance and loading too few products will make visitors navigate too much. I would recommend anything from 3 to 10. But you can make it anything you want as per you Shop needs.